Here is some customer feedback freely given about WARDJet. We are truly thankful for partnerships we have created over the years. Your dedicated and experienced crew did a great job in getting us back up and running in a quick and efficient manner. It has already started to make a difference in our cutting schedule. We have been able to improve our processes and production and we are very pleased. We are very satisfied with the installation of our WARDJet waterjet cutting machine and the great relationship with your company. The best company I have ever worked with. You have the greatest crew on the planet! The extra days of training were a great help! I'm very happy with how everything went. “I wanted to let you know my retrofit went very well last week. Great job on everything on the retrofit. Everything went very smooth. I am looking forward to many years of using this machine and a great continued relationship with Wardjet. “ I want to thank you for taking the time to come here to our facility and make things right. I am looking forward to many years of using this machine and a great continued relationship with Wardjet. 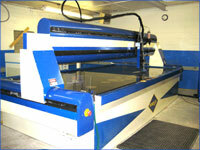 We love our WARDJet waterjet and look forward to getting another one as soon as possible. “A core value of CML is to deliver customer’s expectations which to some extent are determined by ourselves. For example, if told a call will be returned in 5 minutes, the expectation is to receive the call within 5 minutes. To miss this time frame would disappoint the customer yet the expectation was set by ourselves! 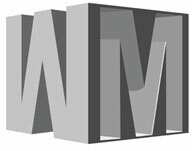 Working with WARDJet Inc. on requirements CML needed in our waterjet demanded some features not commonly found. Future growth would need an additional waterjet. 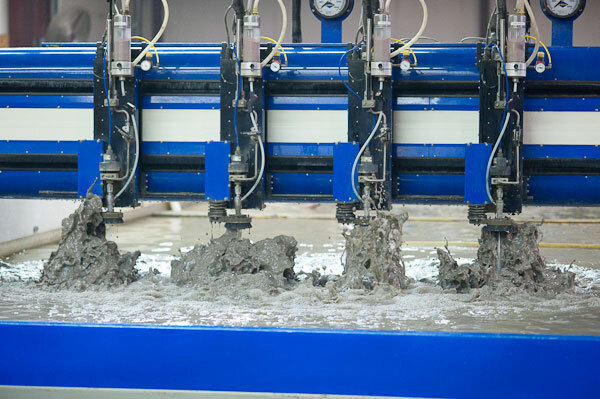 Due diligence with a thorough analysis of several waterjet machines brought the list down to the final few. Then the tough decision of who to trust and buy from raising the question, ‘did you feel you were sticking your neck out’ when selecting WARDJet? With other waterjets operated elsewhere, none of them WARDJet, pressure to choose a tried and tested solution was high. Not at all, we made a careful decision based on financial viability, stringent mechanical, electrical, electronic and software criteria. But above all we were impressed by the full service package of WARDJet. The ability to remotely diagnose and address most every issue other than those specifically requiring hands-on the machine was assuring. Every aspect from shipping to installation to training and service promised has been more than met. What is amazing is we were literally cutting parts and in production the week of our installation. We were told this could well happen, and it did. I still can't believe we were able to set up the machine and get trained to operate it in just one week. 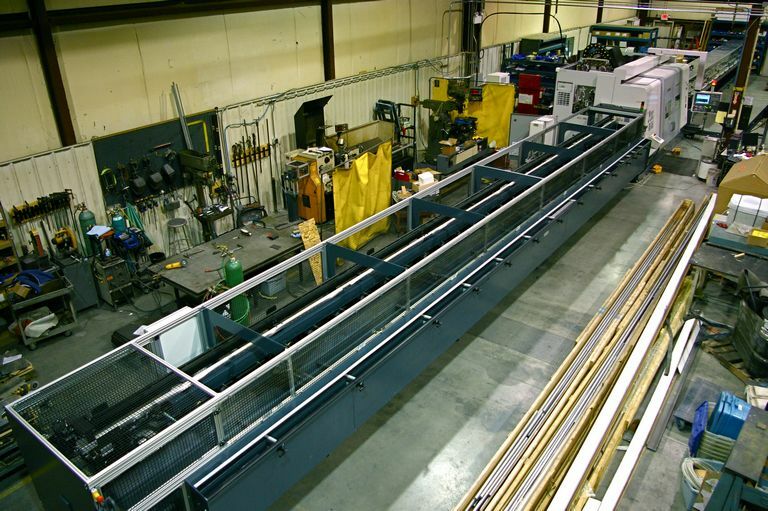 “At Wolverine Machine, we are dedicated to continuous improvements in quality and efficiency, allowing for shorter lead times, higher-quality products, and lower costs. Since 1923, we have continually improved by regularly investing in advanced technology and equipment. This regular investment in technology has been a key to Wolverine Machine’s longevity and success and has allowed us to maximize quality and efficiency. 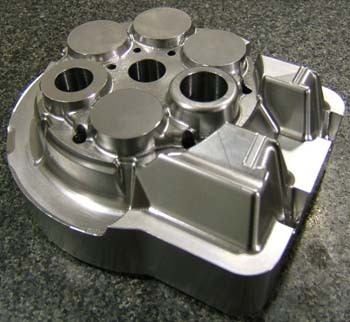 For example, when a customer needed a part that required both water jet cutting and machining, we invested in a water jet cutting machine from WARDJet. This allowed us to produce the complete part in house which reduced cost, assured part quality, and shortened delivery times. We were impressed by the capabilities of WardJet’s machines, and ultimately purchased a Z-813. We have recently purchased an additional WARDJet machine the RX-3013. 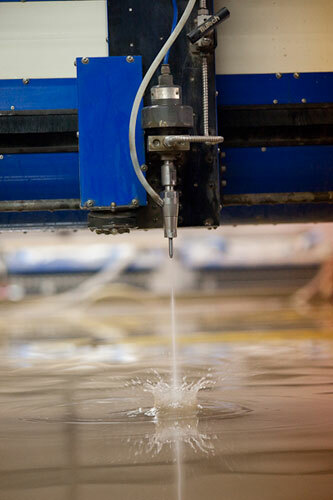 Because of the helpful staff at WARDJet, our staff has become experts in water jet cutting. Also, adding water jet cutting capability has helped us to expand into industries such as solar and wind energy. We are extremely satisfied with WARDJet. "Our WARDJet was installed and has been cutting steel for several weeks. This is a new technology for us, so I am sure you can appreciate our caution. 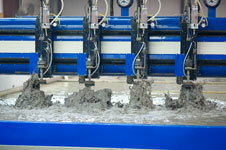 We have already found several opportunities to employ our waterjet system for process improvement. Our production success has been largely due to the very professional training and assistance from your folks. You have my deep gratitude, and I would like to extend our many thanks to your staff as well." We are completely satisfied with their machine and support! "We have purchased a WARDJet Z-813 are completely satisfied with their machine and support! We can cut almost any material you can think of. We can cut up to 10" of Mild Steel. We have a table size of 8' x 13' (which is currently one of the larger tables in the State of Idaho). We have a full 12" Z axis travel for thicker composite materials. We have Sign making capabilities, Tile, and have great software to geometrically nest parts to utilize material to it's fullest extent." We are the pioneers of what we do, and WARDJet is the pioneer of waterjetting! WARDJet has built our company a waterjet cutting system that consistently produces high quality cuts on a wide variety of materials. “Evans & Sons Welding Service, Inc. is a custom fabrication job shop that uses a variety of capabilities to meet the metalworking needs of the exhibit industry. Completing our jobs on time and with the highest quality standards is crucial for the success of our business. When looking to “branch out” and add waterjet cutting to our capabilities we chose a WardJet Z-45 Waterjet Cutting System. During the buying process their sales team was knowledgeable and committed to designing a system that fit the needs of our company. Installation was smooth, and training was excellent. Service after the sale has been quick and efficient. Evans & Sons Welding Service, Inc.
We could not be more pleased with our WARDJet machine and also the support and service that WARDJet has provided. "At JF Berns Company, we both design and manufacture equipment for automating CNC Lathes and Mills. We offer a range of products including spindle liners, bar supports, chamfering equipment, barfeeders and special Loaders and Unloaders. With the addition of the WARDJet, we have been able to manufacture more parts in-house with much quicker turn-around times. The ability to quickly and efficiently cut plastic and other materials has opened our engineering options in the design stage. We also have started to job shop work that we would have not d in the past. The WARDJet has changed the way we design and manufacture in ways we didn't expect until after we had experience with it." Loader/Unloader Specially designed by JF Berns with many parts cut on a WARDJet. Everyone at WARDJet has been awesome. I'm really glad I went with a WARDJet. "We cut all sorts of parts from steel, titanium, aluminum, copper, plastic, and rubber. 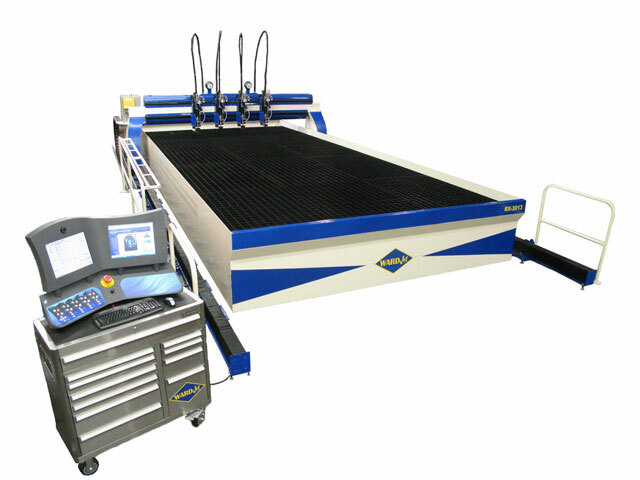 Our waterjet produces clean-cut parts, it's easy to set up, and the touch screen controller makes operation a breeze. It was so easy to learn. We're looking to buy another one. We're very happy about our decision to go with a WARDJet. The technical support is wonderful. WARDJet helped me get started and they did a heck of a job!" We're happy we went with WARDJet. "We went with WARDJet after visiting their plant. They explained everything so well. They were sincere, they really want your machine to do well after you buy it. Having a WARDJet waterjet has made things a lot simpler. We're able to waterjet cut parts without having to machine them first. It really eliminates a lot of steps. It makes everything we do more precise. We can cut everything from 4" thick stainless down to .25", even 10" thick stone. Everything turns out awesome! We love the accuracy of our machine." We are very happy with our decision to buy a WARDJet waterjet. 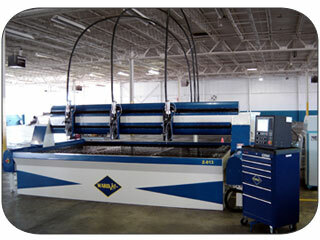 "Waterjet cutting is all we do. It's our business. We cut anything and everything on our waterjet, from titanium to glass. I was impressed with Richard and everyone at WARDJet. Their machines are powerful and easy to use. They didn't take a long time to learn, and they're dependable. We haven't had any issues with our machine so far." I would like to say Thank You , to you and everyone on your staff for the excellent job. "Everyone I met at at WARDJet Inc. was a true professional. I felt that all of the people I dealt with were concerned with my needs. I particularly appreciate Vicki for her fitting everything into my time table. Being a "start-up" company requires a bit more than just moving in a machine and going to work. Vicki seemed to understand these issues without explanation; and accommadated every facet of change graciously. She was very, very helpful. When ever a person changes careers, it is vital to get good information. If you know someone you trust; you can ask them about an idustry. If you do not know someone in a selected field it really becomes a high stakes gamble. Special attention should be given to Bill Krobetzky, ("Skeeter"). He really put out an outstanding effort to do the 'install'. Twelve and fourteen hour days were common place. He was able to answer every question with vigor and often had multiple solutions for my questions. Skeeter's demeanor and attitude was always positive even though he put in some long hours. If you think you can read a book then pilot a plane you understand how important it is to have a hands on experience before passangers get on board. Skeeter was able to work me thru and walk me thru all aspects of the WARDJet ZXA-613; whereby instilling a better sense of the industry, the job, and the machine. His 'hands on' approach complimented his expertise. He is a strong company asset. The WARDJet ZXA-613, performs excellently because of the flawless istall. We did a test run that exceeded my expectations. Calibrations to square were .00033 degrees. Circles had similar demanding figures. You, "Skeeter", Vicki, Dennis, and all the rest of the people at WARDJet Inc. who built, or helped design this machine deserve a big THANK YOU for taking the gamble out of my career change." 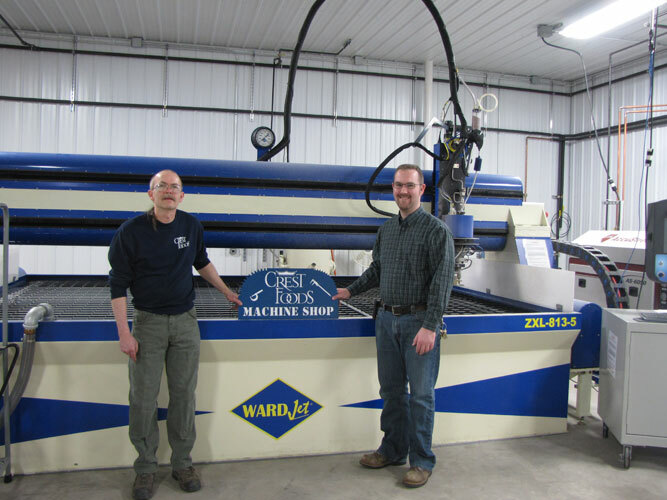 I purchased my water jet from WARDJet because of their technology, service and support. When I have a question, I get an answer within minutes. Everyone at WARDJet has been outstanding! 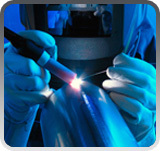 At QC Electronics, we cut all types of material plus we have the unique ability to drill and tap. We cut heavy steel machine plates to tolerance and then drill and tap the holes - all on the water jet. We eliminate the step of moving the part to a mill. 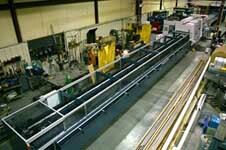 Our cutting table is 72" x 144" and we cut any material up to 12 inches thick. We can import just about any cad format and quoting is fast and easy! 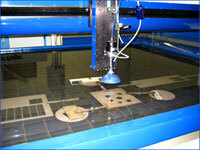 We utilize the water jet in our manufacturing process plus we provide water jet cutting services to other businesses."